Sun., June 10, 2018, 11:31 a.m.
BISMARCK, N.D. – John Erickson breezed into downtown Bismarck’s government building, flashed his ID and picked up a primary ballot. A few minutes later, the early voting ballot complete, Erickson traded pleasantries with friends and familiar poll workers and headed back to tend the cows and crops on his farm north of the state’s capital city. Erickson, 86, the proud non-owner of a neither a television nor computer, relishes the fact that he has never had to register to vote in his native state. “I like life simple,” he said. In an era when hacking has raised concerns about the security of America’s elections and President Donald Trump rages about voter fraud, North Dakota stands out as the only state that doesn’t require voter registration. Residents and most state and local election officials say the low-tech system in use for Tuesday’s primary, as it has been for generations, works just fine. Proponents say the state’s unusual system is no more vulnerable to fraud or abuse than those requiring a registration process. North Dakota does require a valid ID to vote. Only one accusation of fraud – a man charged with voting in two counties in the 2016 election – has been prosecuted in the past several decades, Silrum said. Such a system has a better chance of working in a place like North Dakota, among the least-populated states in the nation. It has about 755,000 people, slightly more than Seattle, and would be just the fifth-largest city in California. But the state has been growing in recent years, as the fracking boom has attracted workers from all over the country. It’s an influx that has changed the character of some towns, where lifelong residents no longer are familiar with all their neighbors. That concerns Kevin Glatt, the Burleigh County auditor in Bismarck. He worries whether the system can keep working as the state grows. While the state is rarely on the national political radar, that is not true this year. Any attempts to sway an election would have high stakes this November, as Sen. Heidi Heitkamp, the state’s only Democratic statewide officeholder, faces a tough re-election fight from Republican Rep. Kevin Cramer. The race is seen as critical for control of the Senate. North Dakota also was one of the 21 states targeted by Russian hackers during the 2016 presidential election, according to U.S. intelligence agencies. There is no evidence the hackers succeeded in penetrating any systems or altering data, but the attempt underscores what voting experts and some members of Congress say is an urgent need for states to beef up their election security. 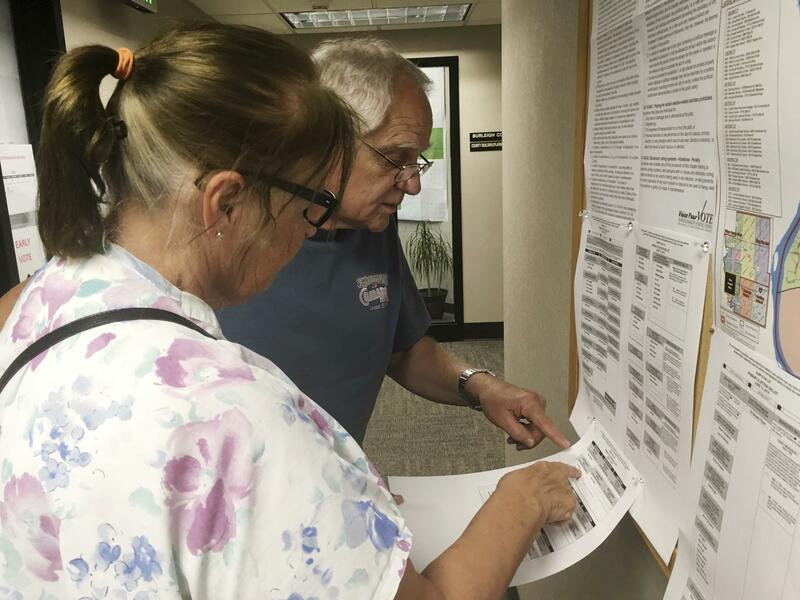 Dave Will, a 71-year-old retired auto parts worker from Bismarck, said North Dakota’s changing demographics make voter registration ripe for consideration. “They should look at voter registration so that we know who they are and if they are from North Dakota,” he said. But his wife of 52 years, Jane Will, said she believes the system is fine the way it is. For nearly two decades, North Dakota has maintained a database of voters, which is based on the names of people who cast ballots at their local precinct after first showing an ID. It is kept updated through any changes made to driver’s license data or vital statistic records. The so-called central voter file shows whether a person voted in each election but does not list political affiliations. Election officials say its only goal is to generate electronic election day poll books used by precinct workers to check IDs. State Rep. Josh Boschee, a Democrat running against Secretary of State Al Jaeger this fall, said the state’s election system security has fallen behind under Jaeger, who has been in the job 26 years. He has called for more comprehensive election system audits. Jaeger said the state continually updates its cybersecurity protections as new ways of targeting are identified. The retro system might also be seen as an extra measure of, said Mark Jendrysik, chairman of the University of North Dakota’s political science department. Every county also uses paper ballots tallied on machines that are not connected to the internet. “It’s very hard to hack something so low-tech,” he said. North Dakota actually was among the first states to adopt voter registration, in 1895, but lawmakers repealed it in 1951. They criticized it as cumbersome and costly, and it has never returned. North Dakotans generally prize their system, some because it’s unique to the state. Nineteen-year-old Tanner Carlson returned home to the town of Baldwin last month after completing his freshman year at the University of Oklahoma. He recalled a discussion in his political science class when he pointed out his home state’s lack of voter registration, a fact that seemed to surprise his classmates and even the professor. Published: June 10, 2018, 11:31 a.m.